I’ve started this review several times. I’m honestly not sure what to say about this classic novel. In a word, it’s wonderful. What else can I say? It was originally published in 1970, and won both the Hugo and Nebula Awards for Best Novel. Of course, the awards and all the accolades since were well deserved. Blackstone Audio published this unabridged version in 1999, and I found it on Audible. Tom Parker does a fine job with this straight narration of the material. Not fantastic, but better than adequate. Once I eased into his flow, I had no problem maintaining attention, but I think a bit more could be asked in the characterization department. The main character in Ringworld is a 200 year old human named Louis Wu, who is approached by a Puppeteer (one of an alien race) who in turn is building a team to visit a star system that has an fabricated ring around it. The complete team includes Louis Wu, the Puppeteer, a Kzin, and a human female. The reasons for all these choices become clear during the novel. Niven’s style is such that you can be awed then amused on the same page. His characters are very comfortable with life. They talk physics like we discuss where to have dinner. After more than thirty years, the story remains interesting and the ideas fascinating. I highly recommend this audiobook, whether you’ve experienced Ringworld already or not. 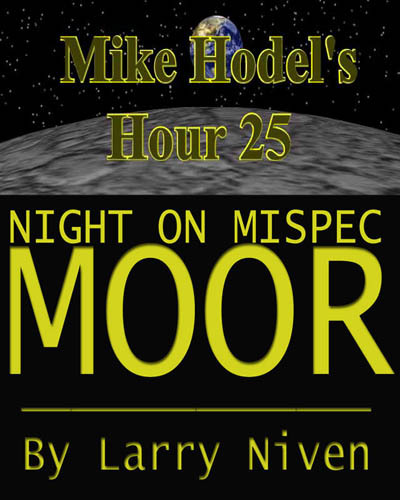 For the 2001 Halloween broadcast of Hour 25, Warren James, the show’s host, with the kind permission of author Larry Niven, read the short story “Night On Mispec Moor”. This excellent tale was first published in Vertex Magazine‘s August 1974 issue. Thankfully, internet archiving allows us to still listen to this gem of a story! And though Warren James is not a professional audiobook narrator, his reading is a good! One minor issue though – as with any Hour 25 broadcast the volume has to be turned way up and there is some digitization to the sound. James also includes a short introduction to the story, and its well worth hearing. So if your in the mood for a really spooky hard SF horror story check it out. The blurb above is a bit of a lie, no longer is Ringworld unique. There is Rama, Arthur C. Clarke’s giant tube shaped alien habitat, Bob Shaw’s Orbitsville, a huge Dyson’s Sphere built by mysterious aliens and the hungry alien construct called Gaea of John Varley’s Titan. Indeed, there have also been three other books in the Ringworld series – admittedly all of them are set on the same Ringworld. But the first Ringworld novel, published in 1970, was the first of this new kind of SF novel; the novel of the big big thoughts, or as David Gerrold calls it, “the enormous big thing”. An idea, a ‘what if’ so massive and so imaginative, so rife with unforeseen consequences that the characters must investigate it just as we do. Kind of like science fiction for science fiction characters! Ringworld was such a big idea in fact, that the three sequel novels were published in an effort to examine the impossible gigantitude of the consequences of its existence. 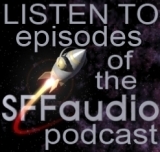 In this the fourth, and perhaps final installment of the Ringworld series, we see more of the problems of existence of such a structure fixed, visit with old characters (Louis Wu, Acolyte, The Hindmost and Tunesmith being major players) and meet some new ones too. There are some genuine surprises here, and some edge of your seat excitement, but as with the previous two sequels the biggest surprise is still the same one from the first novel – and that of course is, just how massively huge the Ringworld is! Its size still staggers the imagination… a narrow ring, only 0.997×106 miles wide, with two perimeter walls climbing 1000 miles high, to hold in the air, the ring itself is 93 million miles in radius, a single spinning world shaped like a ribbon around a star – with a habitable area of over 3 million Earths. What couldn’t happen in a place that big? 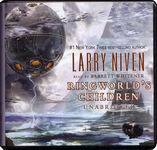 Author Larry Niven cemented himself as the standard barer of Hard Science Fiction, with the publication of Ringworld. If he had done nothing else, he’d still be thought of as a prodigious figure in the field. But he’s not rested upon his laurels; he’s expanded, refined and continued the Ringworld adventure. In a way, that was a mistake. You can’t top an idea this big by telling more adventures about the same world. On the other hand, I personally wouldn’t have had it any other way. 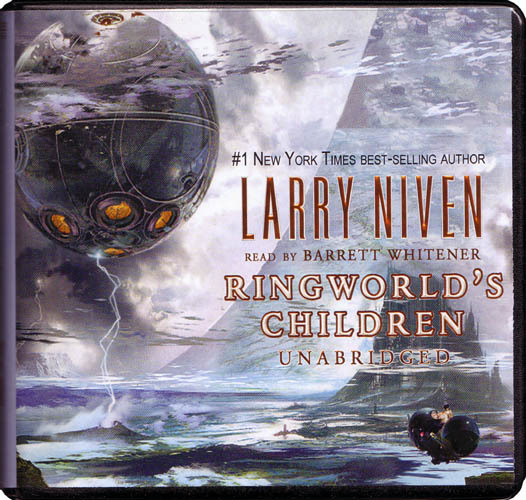 I enjoyed nearly every minute of the nine and a half hours of listening in Ringworld’s Children. In fact, I would have been happy with another nine hours! There were a few parts that were dry, sure, but they didn’t last very long and they moved the plot along. I do wish Niven had spent some more time exploring the inhabitants of his creation; we meet only a few new hominid species, and unlike in previous installments, we don’t get a full sense of their ecological niches. But given that much of the action takes place in space around the Ringworld perhaps it couldn’t be helped. Much of this action is necessary though as many threads from the previous two sequels needed tying up, especially if this is indeed the final chapter in the Ringworld series. Barrett Whitener, who seems to be recording nearly every Blackstone science fiction title coming out these days, was actually not a great choice as reader for Ringworld’s Children. It’s not that his reading is poor – it wasn’t. In fact, I like the way Whitener read it, I just think that his tone was all wrong for this particular novel. His various alien voices didn’t sound at all alien. Mark Sherman, who did such a terrific job with the alien voices in Larry Niven’s Protector (also recorded for Blackstone Audio) would have been a much better choice to give voice to Ringworld’s Children and its many alien characters. That said, I still enjoyed the heck out of the audiobook, and I can’t fault Whitener’s performance in the least. When the numbers and the physics are coming fast and furious it’s nice to be given the words by a good reader who can handle the text. Ringworld’s Children, all in all, is truly a worthy addition to the Ringworld novels. Long live Larry Niven!